One piece of background information is needed for this post - I am a Google Chrome user. I'm sure most of you can understand the use of this browser, but if you haven't already made the switch from Firefox or (gasp!) Internet Explorer, please do for these reasons: safety, ability to share bookmarks across devices, integration with Google Accounts (Gmail, Calendar, Drive, Blogger, Analytics, AdSense, etc. ), it's extensions (Pinterest, AnyDo, Evernote, etc. ), and most importantly, it's tab-enabled. 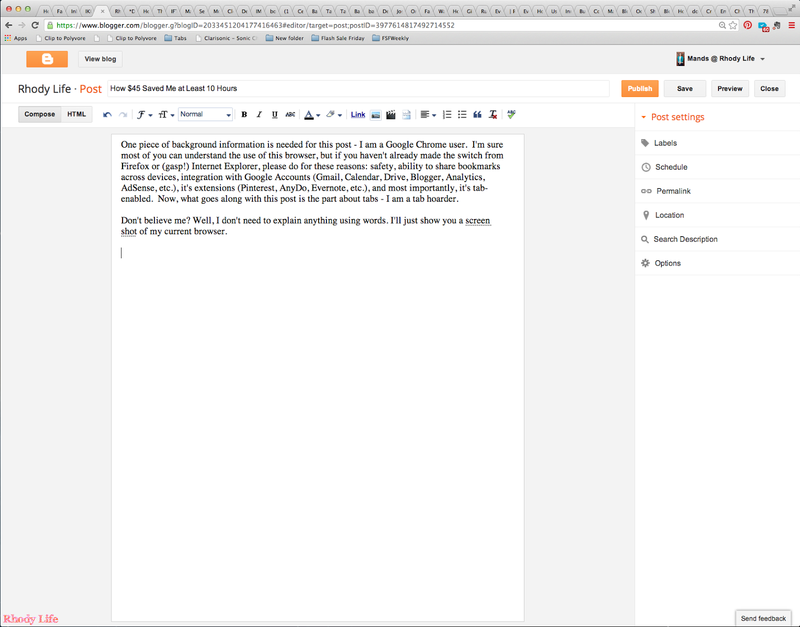 Now, what goes along with this post is the part about tabs - I am a tab hoarder. Don't believe me? Well, I don't need to explain anything using words. I'll just show you a screenshot of my current browser. I won't make you count, but as you can see, there are a lot of tabs open - 52 to be exact, but that's just on this one browser window, on this computer. I use almost all of these on a daily basis, and the others that I don't visit as frequently are there as a reminder that I need to check something. Now, you're probably asking, "What does this have to do with this post?" Well, one of the tabs that I have open is above is the Sears webpage. I refresh the page every morning to check what's been put on sale. One day a few weeks ago, I finally had hit the jackpot. The DeWalt Random Orbital Sander that I had been eyeing was marked down to just $45! I decided to save on shipping so I stopped by the store after work with the intention of purchasing it. Turns out, though, that the price was only valid for online purchases, and the in-store price was $60 - not outrageous, but still more than I wanted to spend. Bummer, right?! I was disappointed, but then I figured out a secret! I decided to just bring up the Sears website on my phone, order the sander, and set the delivery option to In-Store Pickup! Since I was already at the store, I just had to walk over to the Merchandise Pickup Window, and grab the sander. And I did just that. I was able to get the sander for the online-only price of $45 and had it within 5 minutes at the pickup window. So, there's a tip for when you are in store. Always check the online price before making your purchase, because that nifty little "In-Store Pickup" option can help you save a lot of money! Now, as the title of this post suggests, this sander has saved me hours and hours of time. How? About two weeks ago, we removed all of the interior doors on the first floor to paint them. In addition to that, I also removed all of the hardware and gave it a good bath in some soapy water. They really needed some TLC, but that's for another post. I wiped the doors down to get some of the grease and buildup off of them, and then sanded them down using my brand new random orbital sander! So, for a total of 10 doors (so far! ), I was able to save myself at least 10 hours of sanding, since each door took me about 15 minutes with the sander rather than over an hour by hand. Please ignore the gross painting/cleaning/tool-using clothes again. It's also necessary to dress in layers for working in the basement. Best investment ever. Seriously. I haven't even tackled the doors on the second floor yet, not to mention all of the furniture that I will be refinishing, so this is easily the best $45 I have spent so far in my home renovating and DIY-ing. And for the amount of doors I was sanding, I probably would have gone through that amount of money in sandpaper had I been sanding by hand! We just put the last coat of paint on the doors and today is the end of the 24-hour curing process I like to let them sit through, so we will be putting them back on the frames tonight after work. I'm so excited to have doors back - the cats are messing with things in closets and it's just awkward because we can't have guests over when there's no bathroom door! Have you purchased a tool using Sears' In-Store Pickup option? Were you able to catch a break in the price, making the purchase that much more justified? Please Note: I was not compensated for writing this post. I was not contacted by Google Chrome or Sears to provide this information and review. All opinions are my own. This has to be one of the most exciting transformations that I have completed so far using just paint! Are you ready for it? Great, because I can't wait to show you! Remember the corner bedroom that was the only room in the house that had natural wood-tone trim in it? Well, it's gone! Forever! The same weekend that we painted the small bedroom/craft room, we also tackled this room. With the help of a family friend (Thanks Again!!!) we were able to actually paint two rooms completely, one of which was the craft room that I already showed you. The other, I haven't yet - I'm not quite finished with some non-paint things, so that's on hold for right now. But, this room. The transformation is amazing, guys! So let's get to it, right? Here's the before. Please ignore the large rolled-up rug and the box of crap in the middle of the room. The rug weighs over 100 pounds, and I just didn't feel like moving it. Boring, right? I mean the wood is nice and all if you like stained wood, even though it's just bead-board, but it wasn't working for me. So, we changed it. And now? I think it looks fabulous! Huge difference, right? The power of paint, right there folks. I am so in love with it and can't wait to start adding in the furniture I have planned for the space! Now, while you may think that was just too easy, let me tell you that it wasn't as easy as it looked. It took two coats of green paint, two coats of primer on the wood, and then four coats of white paint in order to get the coverage we needed. And not only that, but I had to do a lot of caulking where the seams on the bead-board were showing and the nail holes were never sealed. 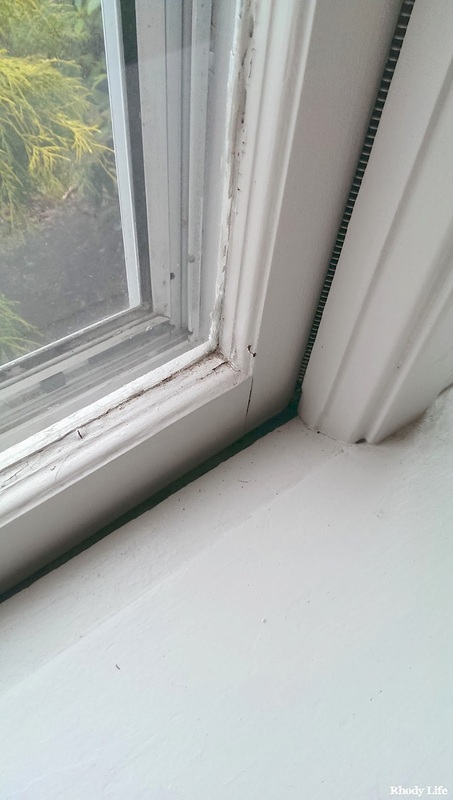 Also, you might not have noticed from the before pictures above, but the quarter round along the base of the moulding wasn't actually quarter round. It was concave, ugly, broken in some spots, and the worst thing I found was that whoever installed the moulding nailed it into the hardwood floors! I couldn't have been more furious when I found that out. But, that explains the giant gaps between the moulding and the bead-board - it wasn't even attached! Instead of just working with it, however, I decided to replace it. A few 8' sections of quarter round wasn't going to be too much for me to handle, especially when it makes such a big difference in the way the room looks. So, I kept the old molding in place so that I could protect the floors when we were painting, and since the new quarter round I was buying was going to be slightly taller, I didn't have to worry about being neat down there at the bottom. Once I had three coats of white paint on, I removed the existing foot moulding. And it was so easy. In fact, after I had done one wall, I had to video the removal of the moulding on one of the others, because despite it being nailed into the hardwood floors, it came up like it was just installed with double-sided tape! Next, I figured out the measurements of the amount of quarter round I needed, and then began cutting, using my miter box. I ended up purchasing PVC quarter round because it was cheaper than wood and was already primed, so it made the project just a little easier for me. Using the existing pieces of moulding as a guide, I was able to figure out the cuts that I would need to join the pieces together. If you are not working with existing quarter round, figuring out the cuts is a lot easier than you would think. For a perfect 90 degree angle, which is what you will typically have in a room, you will need opposite 45 degree cuts on your two intersecting pieces. You want the cuts to be so that the back of the moulding is the longer side, which you can see in the picture below - that is a picture of the right side of a corner piece being cut. For long walls that you need to add additional straight pieces to, think about the cuts like you accidentally cut a piece into two when you didn't mean to. Those two pieces will go back together perfectly, if you just put them back the same way you cut them. In other words, make sure that the pieces of moulding are facing the direction that you want them to, then do one of the cuts on one of the pieces, and then the same cut on the other. Don't over-think the cuts - they will work out! Make sure to dry-fit all of your pieces first, that way you can make any changes that you need to with additional cuts or even sanding. You want the pieces to fit tightly, but not too tight, as you don't want them to warp or bend. After you have your pieces cut perfectly, you are ready for install. I was so excited for this part, because I had just bought myself a pneumatic nail gun! I got it on sale at Sears, and after using some of my points from previous purchases, I only paid $60! Talk about a great deal, right? I already had my moulding pieces in place from the dry-fit, so I just moved around the room with my nail gun, putting one nail in the center of each piece, and then every 10 or so inches to each side, including one towards the end of each piece. After each piece was in, I tested to make sure that it was attached securely by gently pulling at it and then I added some extra nails when necessary. Please ignore the gross painting/cleaning/tool-using clothes. I was a stylish DIY'er until I ruined my favorite pair of jeans. Once all the moulding was installed, I caulked the seam between it and the baseboard, and put a little dab on all of the nail holes, and then put one last coat of paint on everything to blend it all in. After I was done, I was so proud and amazed at the way the room looked. It's such a dramatic difference in the look, and it is so much brighter with all of the white paint! Now to add some furniture! Woohoo! Do you have a pneumatic nail gun? 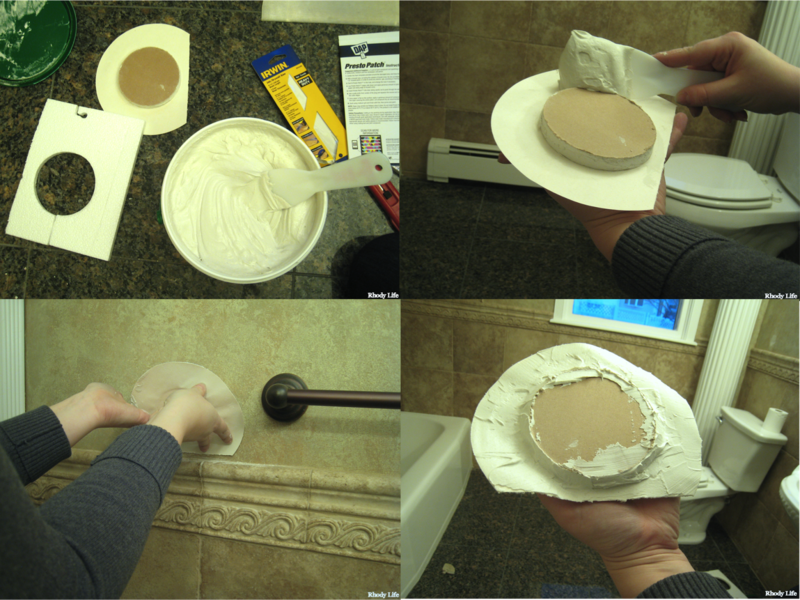 Ever installed moulding before? I can't wait to do more! I just realized that I never told you guys that we had some windows replaced! This happened way back in December, so let's rewind a bit, shall we? With a renovation having been completed in our house in what we believe was 1999, or in other words, way before we were even adults (I was in Middle School! 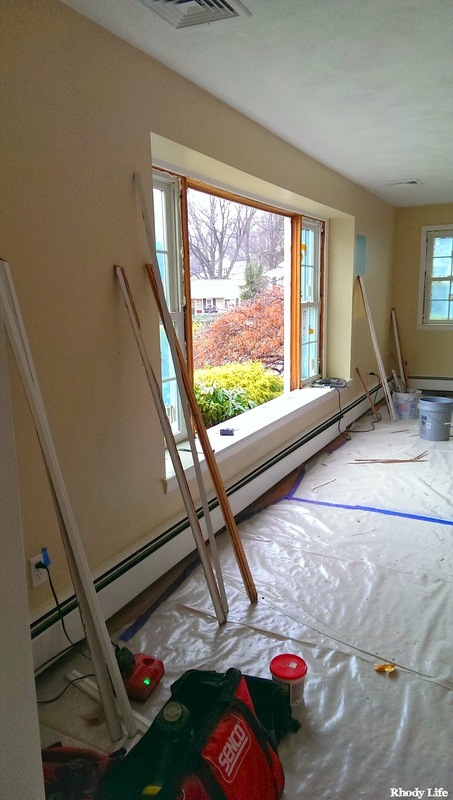 ), half of the house had new windows installed. The other half of the house still had its original windows, you know, the ones from 1955! 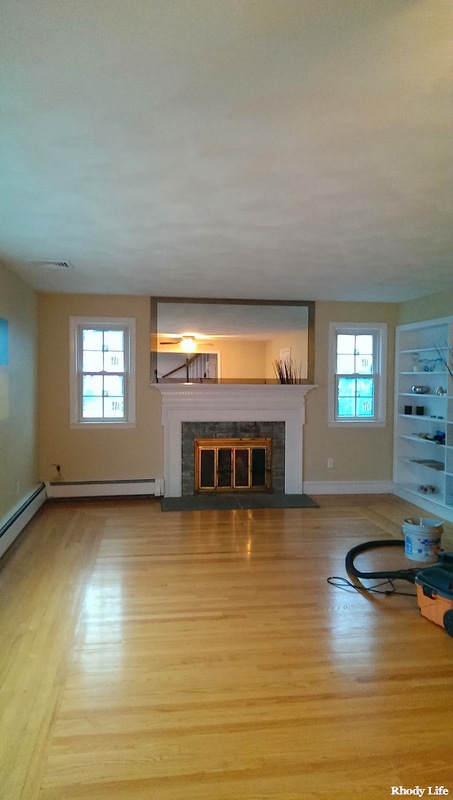 We bought the house knowing that at some point we would need to replace the windows, and while it wasn't necessary that they be replaced now, we came across a great deal and decided to bite the bullet and replace half of the windows that we had on our list now and do the other half sometime in 2015. Funny enough, half of those windows are in one room alone, so it worked out really well! We decided that right now, the front Living/Dining Room combination area was going to be used more by other people than the back bedrooms, so that was our priority in replacing that room. It's the room with the fireplace in it too, so having a non-drafty and pretty looking room was important in having people congregate to enjoy the fireplace and the dining area we will be adding in. 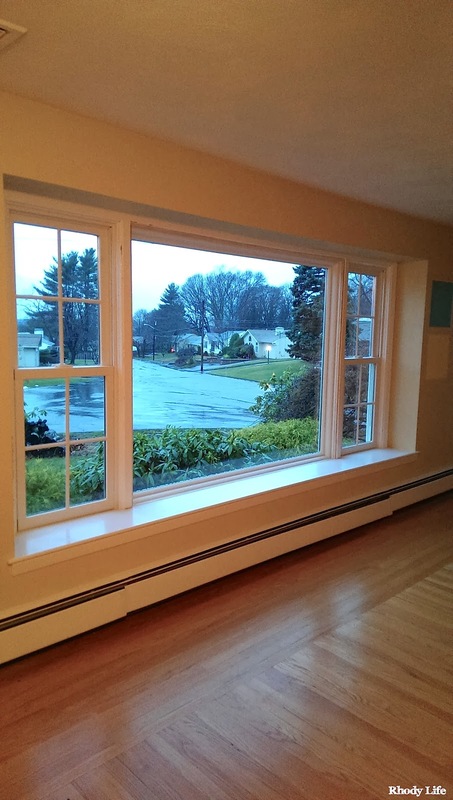 As a reminder, here are the windows in the Living/Dining Room before we had them replaced. From far away, they don't look too bad. But, once you get up close to them, you can tell they are old, made completely of wood, drafty, and coated (even the glass has paint on it!) in at least one chipping and cracking layer of lead paint - which we knew about when purchasing the house. In fact, in the second picture, you can see how the window doesn't even fit in the frame anymore and you can see the spring mechanism that moves the window up and down. That alone should be enough to show you how drafty the windows are. For the last few months, we've had a kitchen towel shoved into the space to keep some of the cold air from coming in the house. Needless to say, the windows needed replacing. I don't know the entire process for removing the old windows and installing the new ones, but I do know that these guys were quick! They started the work around 10am and finished right around 5pm, and as far as what they did do, I know that they carefully removed the existing window trim to reuse it after the install was complete, they removed the old windows without breaking any glass, installed the new ones, again, with no broken glass, thankfully, cut and installed some new trim where the old trim wasn't the right size, caulked the trim and the outside of the window framing, sanded down the caulk and trim, cleaned their work areas with actual cleaner, and lastly, performed a lead test to make sure that all debris was removed according to State law. That's a lot of work for two people to do in just one work day! I was very impressed, since on top of all of that, it was also gross December weather with constant rain and temperatures in the high 40s! I wasn't able to get too many pictures of the process, as the installation team had the room sheeted off to keep all of the heat in the rest of the house and the debris contained to that one room. 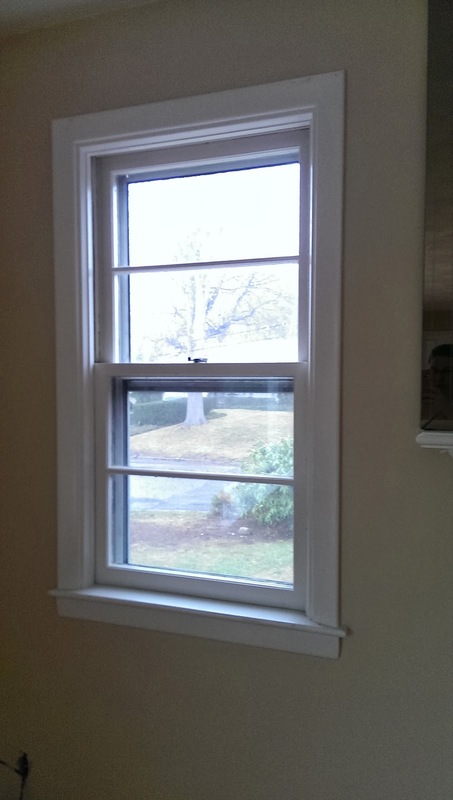 I was able to snag two photos really quickly, both of which show some new windows installed and one missing. I asked them about the large picture window and they estimated that it weighed close to 300 pounds! It's crazy to think how heavy glass actually is! I wish I could have seen more of the process, but it was actually kind of nice to just have seen the before and then see the after. Different than most projects around here since I am the one seeing them through. 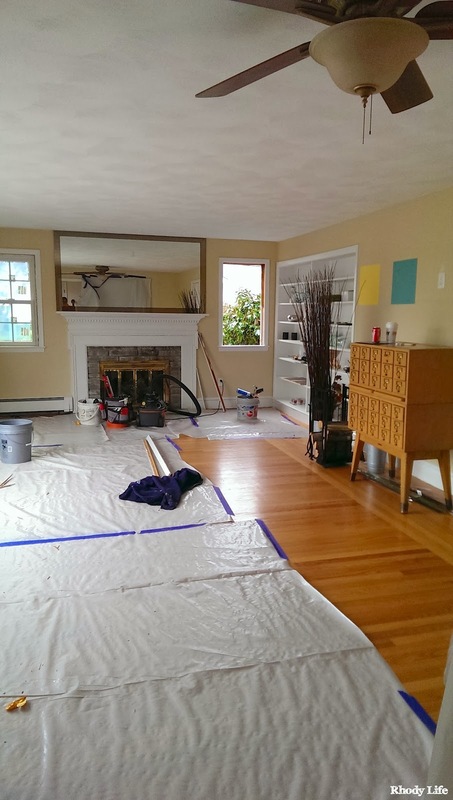 It kind of made me feel like one of those renovation home shows, where they ask you what you want then send you away (all the way to the Kitchen!) and don't bring you back in until the space is finished! I like it better when I can see the progress though. I'm just curious like that, I guess. Anyways, after everything was installed and cleaned up, I was finally able to get back into the space to see the newly installed windows, and they looked great! Ah! So much better and so much more efficient!! We decided to go with a grille on each of the panes because we wanted the front of the house to match the windows in the Family Room/Kitchen addition and the Master Bedroom, all of which have those grilles as well. And in terms of screens, we went with a full window screen, much to my dismay, although the compromise on Dylan's behalf was allowing me to choose the HD screens, which allow in more than 30% more light to the room. I can't wait to get this room painted and to start adding furniture! 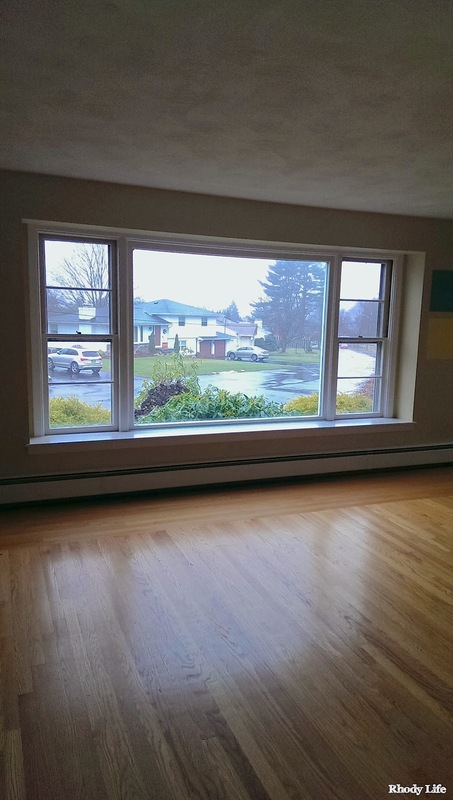 It's going to be so exciting to be able to use this space now that it will be nice and warm and bright! 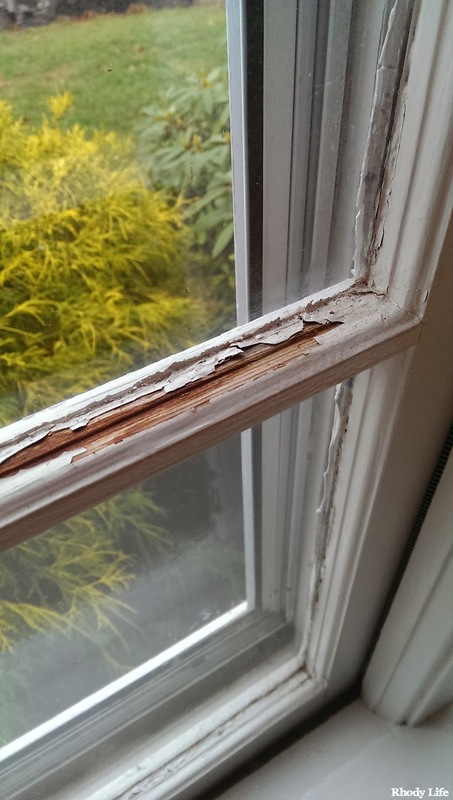 Have you had your windows replaced recently? What was the process like for you? Happy Valentine's Day! I hope that you are all dressed up in your pinks, purples, and reds, and that you enjoy eating candy, going out to dinner, and spending time with those you love. Even though it may be a little later to decorate for the holiday, I figured it was still perfect for me to find some great home decor items for your home that are inspired by Valentine's Day. And while altogether these items may seem very seasonal, individually, they could be used in your home year round! Is Valentine's Day one of those holidays that you tend to skip over in your home decor? If not, how do you decorate for the holiday? Any favorite candies? Over the weekend, I finished up a project that I was so excited to make - I was finally able to get our sunburst clock up on the wall! You may remember this clock from the Family Room design plan, and I believe that I told you that it was inspired by some mid-century style mirrors that I had come across. I have seen some people recreate the mirrors, but I wanted to take it one step further and make mine into a clock. We used to have a clock up on that wall, but the style matched my parents furniture more than it matches ours, so we took it down when we were prepping the walls for painting. Ever since then, you know, back in December, we have constantly been looking at that wall for the time, so we knew that we had to get a clock back up there soon. Now, this project wasn't very difficult, but there were a lot of steps, so this post will almost be picture overload. Sorry, I'm not sorry! The first thing that I did was decide how large I wanted the clock to be. I wanted it to be a statement piece on that large purple wall, so I thought that three feet in diameter would be perfect. I bought a 12" craft mirror from Hobby Lobby, as I didn't want something expensive since I would be gluing things to it and drilling a hole in the center. I also picked up some wooden dowels in two different diameters, so that the sunburst clock had some depth. I chose to go with 1/4" and 3/8" diameters, and bought the 4' dowels so I could get as many sticks out of each dowel as possible. Using just a wire cutter, although you could use a hack saw too, I cut the dowels into lengths of 13", 12", and 11" making sure I had the same amount of each length and width. I chose the lengths because I wanted the dowels to extend to a maximum of 12" from the side of the mirror, and I needed approximately 1" for securing the dowel to the backside of the mirror. Make sure that you take that into consideration when cutting your lengths, as you don't want to end up with a smaller size clock than you anticipated. After cutting the dowels, lay out the dowels in a pattern of your choice, keeping in mind that you may have some that are both different sizes and thicknesses. I started with one of the dowels and placed each one of those in a space on the outside of the mirror. I then followed that by a different size dowel until I used all of the sticks in a consistent pattern around the mirror. I didn't follow any of the directions that others have online, and only did what I liked, so you should do what you feel looks good. Once all of my dowels were in place, I did, however, do some simple calculations to figure out how much space I should have between each dowel. Using the diameter of the mirror, 12", I used a circumference calculator online to determine that I was working with 37.67" and then divided that by 30, which is the number of dowels I had, and got 1.25" between each one. If you want to be picky about placement, like me, you can do these same calculations, but if you don't want to, you can always just eye it. After being satisfied with how the clock looked, I wrote down the pattern of the dowels, then I took them down into the basement to my spray painting station and coated them with some silver metallic spray paint. Don't forget that the best method of spray painting is in light layers and not thick coats, so you may want to put three or more layers of spray paint on the dowels in order to get them evenly covered. While I was waiting for the dowels to dry between layers of spray paint, I started to prep for drilling the hole in the center of my mirror for the clock mechanism. First, in order to protect the glass surface of your mirror, prop it up on a soft, but raised item. 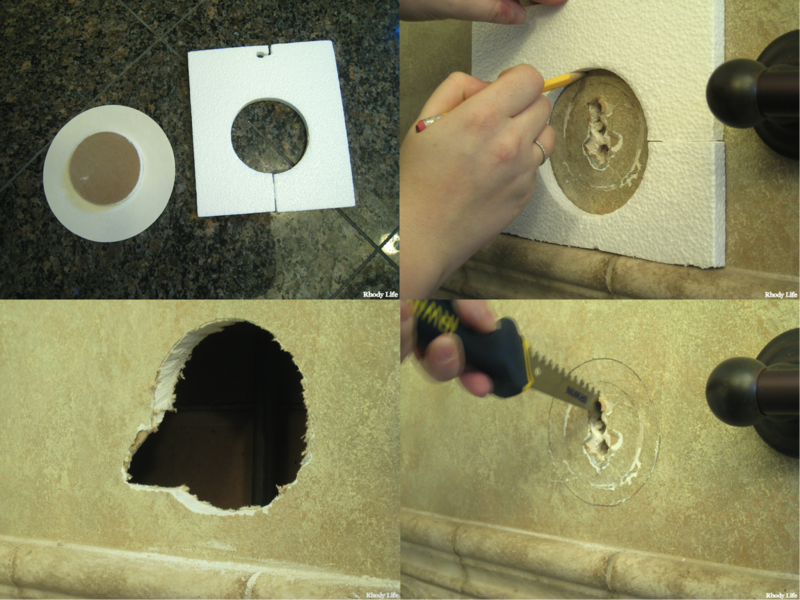 As you can see in the photos below, I used some cleaning cloths I had and supported the mirror on them, while at the same time, leaving the center unsupported, that way the drill bit wouldn't hit the towels or the work surface when it finally cut through the glass. Without having the proper tools to find the center of my mirror, I used a technique I found online, where you draw three lines of equal length that intersect with two edges of the circle, then draw a line perpendicular to that first one at the center point of the original line. The perpendicular lines will intersect each other at the center spot of your circle, or in this case, your mirror. Make sure to do this on the back of the mirror, as you likely won't have much success drawing on the front side without using a pen or marker that would leave permanent marks. You may remember that I purchased a glass drill bit, and I showed you how to drill a hole in a wine bottle for all of those neat projects you may have in mind. I used my 1/2" drill bit for this project since the post of my clock mechanism was slightly larger than the 1/4" bit that I also own. Applying a medium amount of pressure, I began drilling a hole in the center of the mirror. Make sure that your drill is is a level position and don't apply too much pressure, as you don't want your mirror to shatter. Once you have an indentation made in the back of the mirror, begin adding a few drops of water to the surface of the mirror where the drill bit is making the hole. This will help the glass drill smoothly instead of chipping or cracking when you are drilling. If the water begin to dry out, you should continue to add more, just a few drops at a time. Continue drilling into the back of the mirror, gradually adding pressure so you eventually get the size hole you need for the post of the clock mechanism. This may take up to a half hour, depending on how thick your mirror is, how sharp your glass bit is, and how much pressure you are applying when drilling. Once the hole fits the clock mechanism, you can drill slightly on the front side of the mirror just to make sure that the hole is smooth and free of sharp glass shards, but this step is optional, and slightly chancy since the clock mechanism will likely cover any areas in question. Once you are done drilling, you are ready to attach the smaller mirrors to the spray painted dowels. I bought small mirrors that were 1/2", 3/4", and 1" in diameter just to add some depth to the dowels. I laid out the dowels in the pattern that I determined earlier, and then placed the small mirrors below the dowels in order to determine the pattern for those. Once you have your layout finished, attach the small mirrors to the dowels. I used Gorilla Glue to do this, but I didn't realize how much the glue bubbles and expands, so if you use this, proceed with caution, because you might end up with some of the mirrors stuck to your work surface, or glue stuck to the front side of the mirrors. If you are looking for alternative adhesives, try silicone, and even though I haven't tried it, hot glue from a glue gun may also work. For actually attaching them I found it easiest to place the small mirror face down, put a small drop of glue on the back, and then place the dowel on top. This allowed me to move the dowels as the glue was drying, in case they began to slide off off center. After the glue dries, you are ready to attach the dowels to the back side of the large mirror. Since I struggled with the Gorilla Glue, I used silicone for this step. To make sure that I had the spacing of the dowels set correctly, I placed them all on the back of the mirror, leaving an inch on the back side of the mirror, and was able to move them around until I had an even placement of 1.25" between each one. Once they were in place, I then used the silicone tube in the caulk gun and placed a thick bead of silicone over the dowels. Using a small craft paint brush, I spread the silicone around each of the dowels so they would be secured onto the mirror. In the picture below, you can see how the top left corner has just the bead of silicone over the dowels, where the rest of the back of the mirror already shows the silicone spread around the base of each stick. Let the silicone dry and once you are confident that the dowels are secure in place, you can attach the clock mechanism. Each mechanism will probably be slightly different than the other, but mine was very simple. Slide the post through the hole you drilled in the mirror, then on the part that shows through the front side of the mirror attach the washer and the nut and twist it until it's tight. Don't over-tighten the nut, because you don't want to crack the mirror after you have gotten this far! Finally, attach the clock hands, and if your mechanism came with one, pop on the little cap that keeps the clock hands on the post. Lastly, clean off the front sides of all the mirrors with your favorite glass cleaner, and then hang your masterpiece up on the wall!! Ta-da! I am very happy with the way that this project came out, however there are a few things I think I would have liked to change. It turns out that these clock hands are just a little too small for the size of the clock face, so it does look a little strange. Maybe I will try to find some different ones, because changing out the clock mechanism should be easy as long as the post hole can remain the same size. The other thing that kind of irks me is how small the clock looks on the wall! I can't believe that a clock with a three foot diameter could look so small. I thought that would be plenty big enough, but it does look kind of lost up there. Maybe this is just an opportunity to put some picture frames on each side of it. What are your thoughts? Do you love this clock? Does this make you want to create your own in your own style? Should I put pictures on either side to help the wall feel fuller? If you couldn't already tell by the title of this week's Flash Sale Friday, Rhody Life is celebrating the Olympics! Dylan and I are so excited that the Winter Olympics have finally started, and we are really looking forward to watching tonight's Opening Ceremonies. Our favorite event to watch is Curling - not something that you see every day, or something that is readily available to play, but it's such an interesting sport to watch. So, in honor of the Winter Olympics, this Flash Sale Friday is based loosely on the Olympic Rings - round things in the colors of the rings. Most of the logos of the Olympic rings are shown in Gold or White, but the actual colors of the rings are Yellow, Green, Blue, Red, and Black. So, without any more hesitation or rambling about Curling, here are this week's items! Yes, I do know that not all of these things are round, like the rug, for example, but the pattern on it is round, so it plays along with this week's theme. I know, it's kind of a stretch, but stay with me please! You know I'm not afraid of color, so this post really speaks to me. Plus, it can also inspire you to decorate your home a little bit for this once-every-four-year-event (or two if you count Summer Olympics!)! Do you have any of the five colors of the Olympic Rings in your home? Which one is your favorite to decorate with? What is your favorite Winter Olympic Event?